Prefer videos? Check out the Endnote Training YouTube Channel for "How to Use Endnote in 6 Minutes" and other help videos. Find, import, and collect citations. Organize, store, and share citations. Create bibliographies or works cited and cite references while you write. 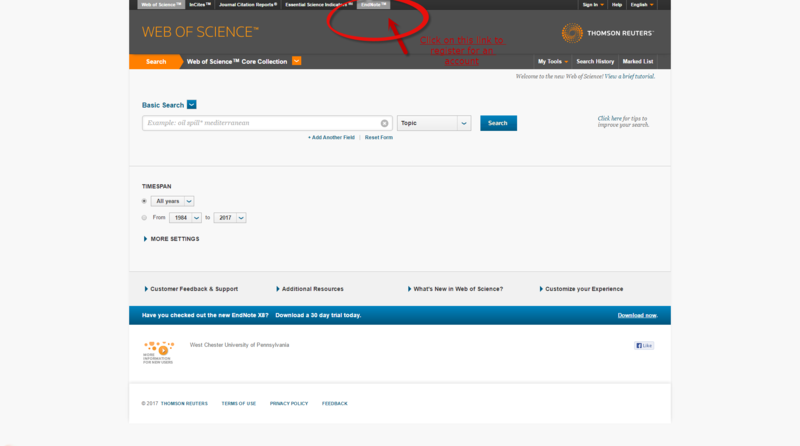 Go through the library's subscription to Web of Science (below) to create the account. Click on EndNote in the top menu bar. 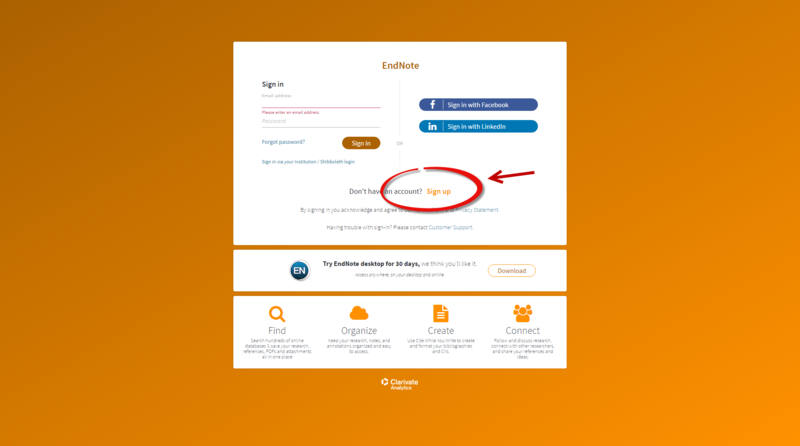 In the middle of the page, click on "Don't Have an Account? Sign up"
Enter WCU email, choose a password, and enter your first and last name. You will receive a registration email from Clarivate to complete the steps to creating your account. Save this email! Most databases provide a way to export citations or references that can be added to your EndNote account - just look for the Export option. For help on direct exporting, go here. For some databases, you will need to save your citation as a plain text file (Wordpad or Notepad) and import that file. For more help on importing from databases, go here. References can be organized into Groups in EndNote. Create different groups based on specific papers, projects, or topics. It is a good idea to create your groups first and then do your research and import your citations. You can also share groups with other project/team members, authors, professors, etc. Now you can manage sharing, edit the group name, or delete the group. Select the citation style you need to use. Select how you want to save your file. To insert references and format citations and bibliographies while you write, use the EndNote plug-in. It will also allow you to save online references to your library in IE for Windows. Click on the best download option for your system requirements and follow the installation instructions. For more help on EndNote, see their online help page. For tutorials and training, see EndNote's training site. You can also submit a question to EndNote's technical site. There are other citation management tools on the web that are free and easy to use.